Oooh! I love the idea of putting coffee in this. It looks divine! So many delicious flavours in this lovely loaf cake! This'd be great as gifts! Happy Thanksgiving! Yummy! I hope i can make one that looks as good as yours! There are some seriously delicious flavors going on in this cake! 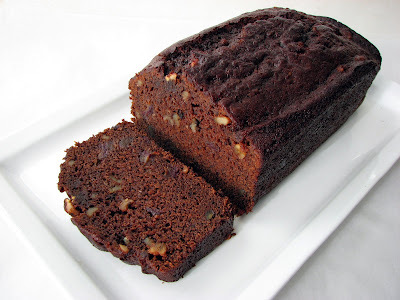 I was looking for something different to do with a loaf cake, and I do believe this is it! oh wow! nuts, dates and coffee- nice combo. i only had preserved dates. havent tried it w/ anything else sadly. bklynharuspex, welcome and thank you very much for your feedback. It makes me happy to hear stuff like this! Tastespotting usually rejects my photos so I'm glad I got the odd one in! I've been wanting to make this cake since the recipe was posted, and finally found myself with a majority of the ingredients, and opportunity, this past weekend. The cake itself was very simple to put together, and though I was a bit concerned because the batter was thinner than most cake batters, it turned out beautifully! The flavors are really interesting, complex and work well together. And, as mentioned, the flavor is even better the second day, so I would recommend making it the day before you're going to serve it. I also thought some whipped cream might be nice with it. Can I feed this cake to make it last longer. I was wondering if we Can use this recipe as a make ahead cake for christmas and feed it for 3- 4 weeks. Also will there be any changes in the baking time if I bake them in smaller foil tins that I will be gifting them. Hello, Julie. I've never put these cakes in the freezer so I can't say for certain that it will work. But I don't see why they wouldn't. The cake is rich and moist and shouldn't suffer too much in the freezer. Just be sure to wrap them properly in airtight plastic bags. 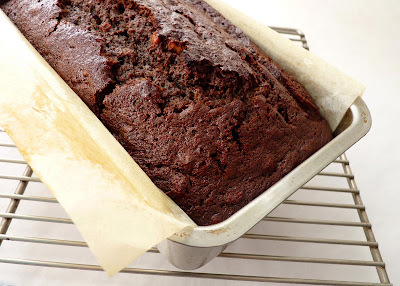 If you are baking smaller loaves, the baking time will be different. Depending on the size of your pan, you may want to start checking the cakes at about 30 minutes. You want to bake them until a toothpick inserted in the center comes out with a few moist crumbs attached. 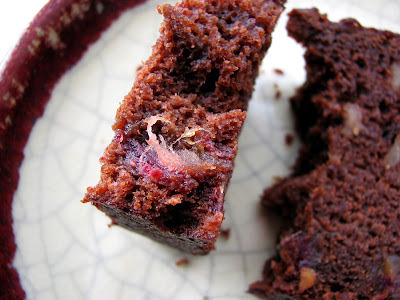 I am looking forward to baking some of these after reading this blog again! I've been making this yearly and this year's may have been the best yet. Thank you again for a delicious recipe. bklynharuspex, AWESOME! 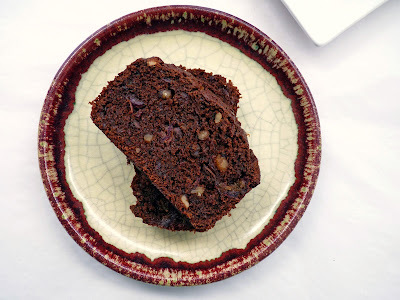 I love the balance between dates, nut and chocolate in this loaf. Glad to hear you enjoy it, too.